There are so many different ways to make Russian Pickled Tomatoes (солёные помидоры), which in Russian, translates to ‘salted tomatoes’. It’s a perfect recipe for when you have lots of tomatoes in your garden, and need to use them up quickly. 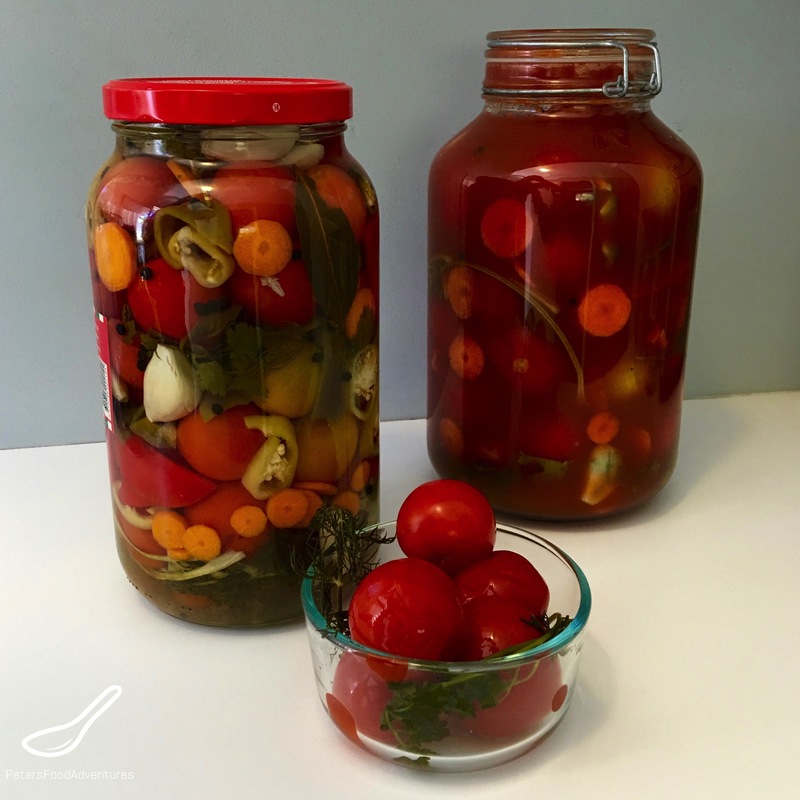 Russian Pickled Tomatoes are great for storing for the winter. There are multiple recipes in Russian that are called salted tomatoes, which can sometimes be confusing. My other recipes have focussed on fresher recipes, where the tomatoes are kept in the fridge and eaten. My favorite is Marinated Tomatoes, which is an updated version of what I grew up with. Using ketchup in the brine, adds extra flavor and spices and is really easy to make. My other salted tomato recipe is a Fermented Pickled Tomatoes which is incredibly healthy, and full of probiotics. My fridge is now full and I need to ‘can’ (preserve) these tomatoes. It will be great to open the jar up in the winter time, when fresh tomatoes in the store are completely tasteless. Pickled Russian Tomatoes provides me a taste of summer, in a jar. The process for canning is different from my other recipes, and requires sufficient salt and vinegar to keep it preserved safely. I’m not an expert on canning temperatures, so please refer to the USDA guidelines on canning found at http://nchfp.uga.edu/publications/publications_usda.html . Some people have a proper water canner, but I just used my giant pot from my crab cooking set, which incidently is also a turkey deep fryer. Adding carrots and peppers are optional, some people make just pure ‘canned’ tomatoes with dill and spices. I can’t pass up the opportunity to stuff other vegetables and herbs in the gaps of the jar, seems like such a waste not to! The tomatoes have a tendency to split their skins in the heat, so you can prick a small hole in the tomato, using a toothpick or even a fork. If you have lots of tomatoes, you can double or triple the recipe easily, but my recipe is just for a single 3 litre jar, which will get me through the winter. It can be hard to find large enough jars to can tomatoes, but I was lucky enough to find and reuse a pickled eggplant jar. Just make sure the lid is good, otherwise the seal will come undone. Russian Pickled Tomatoes are perfect to eat with Plov, and even mashed or fried potatoes or just by themselves. It’s a staple in every Russian house. Bon Appetit! Приятного аппетита! Enjoy your fresh, garden tomatoes by preserving them Russian-style. Pickled Tomatoes (солёные помидоры) with garlic and fresh herbs. I stuff extra veggies between the tomatoes. These canned tomatoes are a staple year round. Wash tomatoes and remove the stems. Prepare sterilised jars. This recipe uses a 3 litre jar, which is most commonly used, and easy to pack with tomatoes. Place the dill, coriander, black currant/horseradish leaves, garlic, bayleaf, cloves and peppercorns into the bottom of the jar. Set aside some dill and coriander if you wish to put some in the middle of the jar, amongst the tomatoes. Place the tomatoes on top of the herb/spices until the jar is full. I usually cut the last tomato in half, so it fits better into the jar. As you layer the tomatoes, stuff the pepper and carrot pieces in between the tomatoes, filling the gaps that are available. To create the brine, in a medium pot, over high heat, add the water, vinegar, salt and sugar and bring to a rolling boil. Using a Pyrex glass measuring jug, slowly add the hot brine into the tomato jar, covering the tomatoes. Close the lid tightly. Place the jar in a boiling water bath to ensure the lid is covered. Full canning recommendations from the USDA can be found here. Keep the tomatoes in the water bath for 15 minutes before carefully removing and placing upside down on the countertop until it's fully cool. The jar should be sealed and ready for storing in your pantry. If the top of your lid still pops, then the seal did not take, so keep refrigerated and eat your tomatoes right away. Enjoy! *Full canning recommendations from the USDA can be found here. How about canned tomatoes and hot sauce? Those are 2 things that I also always wanted to make. The pictures are really helpful! Thank you! What is rofl?? Ahhhh! Thank you! When all else fails, laugh!???? I love the herbs and spices in this! Looks beautiful too Peter! Thanks Lynn! I hated eating these as a kid, it’s funny how things change when you grow up! Yes heirlooms are the best!